Many thanks for the latest newsletter. Our efforts to place the CL44 Guppy into a permanent new home have not been successful to date. When all the endeavour of the past two years was exhausted, the situation became clearer: One of the former VP's of the airline had approached various potential new operators and had identified some work for the aircraft. Alas, he was no longer a VP of the Company and had set about the project without the company's knowledge! So that, in essence, was THAT and so as to ensure that the individual could do no more damage Heavylift removed all 4 Tyne engines! At that stage, I was asked if a Museum or collector could be found for the 44. Just as that task was proving to be difficult, it was intimated that if I 'got lucky' with the Guppy, I could include the Belfast (G-BEPS) which has been resident at SEN for some years! The IWM at Duxford was approached but refused either or both types as did a number of other museums and collections. My hopes of moving the Guppy to the new Bournemouth Air Museum are also dashed due to so many restrictions placed on them by the local Authority. The only positive note is that a German Museum has registered its interest in the 44 and has initiated a report on having the aircraft 'barged' from Poole. Our next Newsletter (August) will contain more up to date news and/or developments. Our 2008 re-union has spaces for guests - Pete Clayton and Brian Kent assure me that they would entertain the idea of buying any other Movers a beer, this is indeed a break through! Later to do a wheels up at RAF Akrotiri. An atomic clock is accurate to within 1 second in 1.7 million years. Hope the eye surgery is mending successfully. Meanwhile I had to enter the helicopter load story pool to place a marker for F Team's 1969 Boscombe Down to Ottawa three helicopters in a Belfast triumph. This was when we stuffed two Wessex (one a humped back RN version), blade boxes, all the necessary offload roller and dunnage, the Belfast flyaway pack, seats for the MAMS team and GE, and, the icing on the cake – still found room on the ramp for a 3rd helicopter, a Wasp; all heading for winter trials in Canada. The fun started when we arrived at Boscombe the evening before the morning take-off to load, only to find that the Wessex were both on cradles designed to be craned on and off flat-bed trucks. Unlike the air-portable cradles which had dinky little metal guide skids, these cradles had square ended wooden beams which dug in to any change in the angle of the rollers paid out for loading. A team search of the hangar from which we operating uncovered a couple of flat 12" by 12" steel plates. But these needed to be curved to produce the required skids to help the cradle negotiate the rollers. In the absence of an audience, the ever resourceful Bob Turner solved this problem by wedging the plates up-right in the tracks of the open hangar-doors, and running over them at speed with the heavy forklift we had commandeered to help with the loading. From memory, the basic load plan was: first Wessex nose first to port alongside the blade boxes, which were then over-stowed with offload dunnage and spare lengths of roller from the eventually cleared ramp. The second Wessex followed, offset to starboard alongside the flyway pack, baggage etc. The roller was then cleared from the ramp to wheel on the Wasp which had to be secured at an angle so that when the ramp closed, its tail just dropped into the gap alongside the second Wessex, finally, triples were fitted around the Wasp for the passengers. Even though it was nearly 40 years ago, I can still recall vividly the orange sodium-lit sight, the sounds and the cold as we offloaded onto compacting snow at Ottawa. Although having carefully lined up the lowered ramp with the dunnage supported roller, this meant that as the weight of the first Wessex transferred onto the external roller, the snow continued to compact, but not uniformly. This required the insertion of additional dunnage and packing to keep the two roller tracks correctly aligned horizontally, while above us the Wessex was threatening to slide sideways off the ice-covered tracking. All the while, the ever compacting snow creaked in protest. Then it was just a case of clear the dunnage and roller, raise the ramp for the second Wessex – and repeat the whole adrenalin-raising process all over again. Tony, you will have to correct me as from memory this was before you replaced Jack Murray, but in addition to Bob Turner, the heroes of this epic adventure comprised Taff Price, Sgt Eric Batty and FS Les Mather. Finally, thank you Ian Berry for more memories: I shared Britannia XM496 with F team for runs to Bergan, for Ex Hardfall, in April '68 and to Decci, Ex Bitter Breath in November '68. Thanks for that David - If my memory serves me correctly Jack Murray was promoted to Corporal and replaced Bob Turner ( George Lynes eventually replaced Jack Murray), Tony Moore replaced Taff Price, Dave Barton replaced Eric Batty, Don Wickham replaced Les Mather and Roger Wood replaced you. Subject: Messers Ford, Brocklebank, Radcliffe & Whirlwinds! A response has been prompted after reading the latest OBA Brief..
After reading Chas Cormack's tale about helicopters I must admit I had my fair share too and my first experience with a Whirlwind was offloading one from a Belfast in El Adem in 1969. 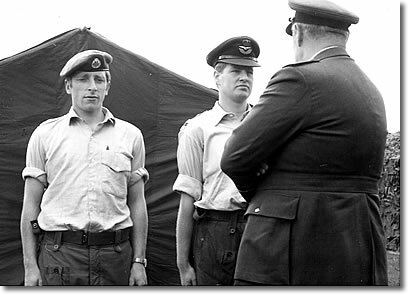 When I was short-toured courtesy of the then Captain Gadaffi, I continued on to RAF Nicosia on promotion to Corporal. During my time there I assisted NEAF MAMS in four rotations of Whilwinds from 230 Squadron (then based at RAF Wittering and flown to Nicosia for UN Duties). Normally the UKMAMS Team remained at Wittering awaiting the return of the Belfast but I do remember one ocassion when Syd Avery and company appeared at Nicosia and so gained a free night stop in the Ledra Palace! Chas also mentions Frank Lightfoot and although we served together in the mid 60s at Acklington I never knew Frank was in Movements until after his retirement! My final confrontation with a Whirlwind was collecting one with a UKMAMS Team from RAF Leconfield on a Hercules and delivering it back to Akrotiri where I was stationed at the time. (A photo of that one may appear in the next Team Brief). I did also manage a few flights in Whirlwinds whilst at Akrotiri and volunteered more than once to be the 'survivor' for their training flights.... not that brave now though! Sadly he's wrong when he says Bob Ford was working in ESG Lyneham - the husband of the woman Bob ran off with worked in ESG! Bob moved back to Kent. 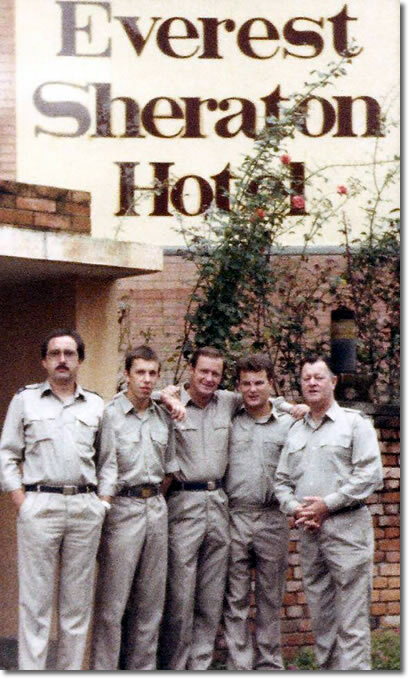 That's Bob Ford on the left and next to him is Brian Clucas - the rather large chap with his back to us was on the AOC's staff. 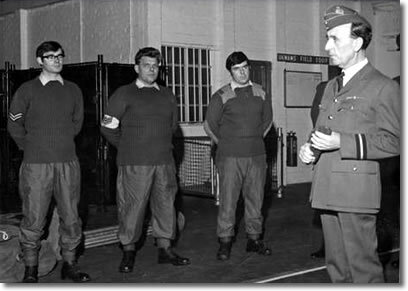 The Training Warrant Officer at the time was Roy Brocklebank, affectionately known as the 'Skull'. Left to right in the picture, Charles Collier, Roy Brocklebank, Bryan Morgan, AOC. I do too remember the rather rough indoor rugby games and the like played by Norrie Radcliffe. During one game Norrie crashed into a guy and he went flying out of the gym through the fire doors. When he came back remonstrating Norrie said, "Twenty press-ups for leaving the court without permission!" In the picture, left to right, Norrie Radcliffe, Bryan Morgan and the AOC. 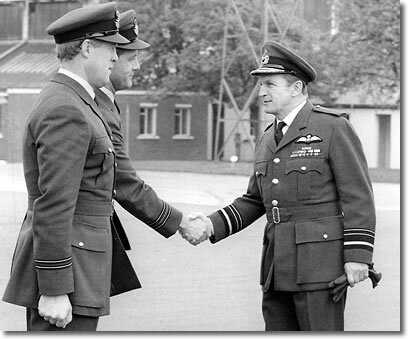 The above three photographs were all taken at the AOC's parade at RAF Abingdon on 24 May 1973. And finally... Nice to hear of Alex Masson offering support on Veterans Day. I would hope that Alex also invites the local Division of SSAFA along next year to fly the flag as well? I have been a Volunteer Caseworker with SSAFA myself for the last two and a half years and helped out with our local Veteran's Day in Cricklade and in the week prior to that at the Steam Museum in Swindon for the Veteran's Awareness Day. Incidentally, if any of the OBA members have not applied for their Veteran's Badge yet they should apply through the website www.veteransagency.mod.uk and it's free. Thanks for the opportunity of digging out more photographs! If you need names please ask. Great memories Ian - thanks! This year's Farnborough air show could have offered the first public opportunity to see the Airbus Military A400M transport in action, but development delays have kept the first production aircraft on the ground. It is unlikely to fly for at least the next two to three months. Early discussions are under way on the future provision of in-service support for the new European transport. 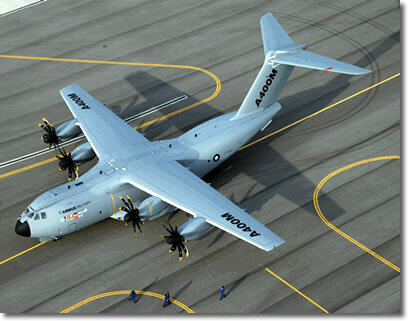 The UK Ministry of Defence recently held an industry day to discuss potential partnered support arrangements for the Royal Air Force's future inventory of 25 A400Ms. "We are exploring with some of our [international] partners on whether there could be some co-operation," said Air Marshal Sir Barry Thornton, the RAF's air member for materiel. "Industry is very keen to work together with us on this," he added. 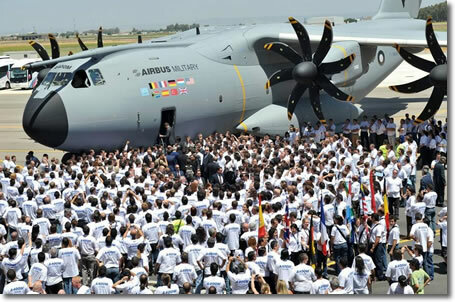 The pressure on Airbus Military, EADS and their key equipment suppliers has never been greater to deliver with the A400M. But if their current schedule holds firm and flight-test activities start in Seville late this year, the aircraft could well grab the headlines at next year's Paris air show: and for all the right reasons. I was sorting out some pictures for you and came across this one of Gus Hatter and his merry men. The original caption on a copy on my office wall read, "Now for the last time, which of you bastards has got my handbag?!" This one was taken Abingdon in December 1972. Thanks Norrie - I ended up working for this Air Commodore when he was at MoD as Director of Mov Ops (RAF) - he had a very pronounced Cornish accent - I just can't put a name to his face. Went to RAF Shawbury this morning for the open day of The Glider Trust, luckily the rains didn't start until after lunch so we were able to enjoy the outside display as well as in the hangars. It was really a Parachute Regiment day and there were many ex-Paras on parade with lots of medals on display; the Parachute Regiment Band gave us an hours music, all very smart and polished and though they were mainly a lot younger than us they had chests full of medals. The Horsa glider restoration is just about complete and they are rebuilding a Waco Hadrian glider along with a DC3 Dakota which is complete less the wings. We were supposed to have a flying display with the Vulcan, the BBMF Dakota and the RN Historic Flight Swordfish but unfortunately because of the weather conditions all were cancelled. Alex: Squadron Leader Sally Varley was strolling around the hangar in civvies and recognised me straight away; said I was better looking than that 'other chap' but don't be too despondant she told me she's keeping the photo of you that I gave her at Cosford in her archives! 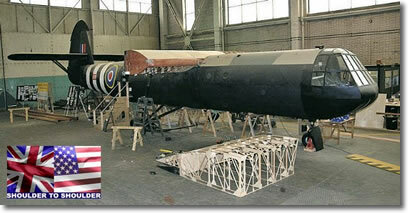 It's good that they are preserving a Horsa glider - they played a huge part on D-Day. I trust you are keeping well these days and keep up the good work. I think the site is excellent, keeping up the maintenance of the site is no doubt keeping you very busy. I'm sure I know some of the gentlemen in the mystery photo. 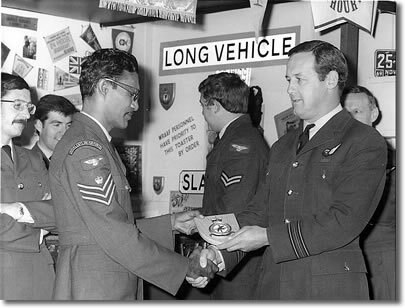 Not sure what the occasion is and who is being presented with the shield but I think it may have taken place at the Movs School at Brize in the 70s. The guy on the left is (I think) Paul Newman who is stood next to very young Tim Newstead. I think the other guy glancing away in the photo is "Boot" Pratt. If I'm wrong no doubt folks out there will put me right. Take care and regards to all those "movers" out there. Demolition has begun at RAF Brize Norton in Oxfordshire signalling the end of the road for some of the worst military family homes in the UK. The demolition work is paving the way for the construction of brand new homes for the officers and airmen who will operate and support the next generation of RAF transport and air-to-air refuelling aircraft. Ministry of Defence contractors began work yesterday, Monday 14 July 2008, pulling down flats on Upwood Drive; over the next six months they will also be demolishing blocks in and around Northwood Crescent and Stanmore Crescent. In all around 70 flats will be demolished in 2008. The flats were built in the mid-1960s, and are now assessed to have reached the end of their useful life. Under Project CATARA, which will see the RAF tactical transport capability move to Brize Norton to join the strategic transport and air-to-air refuelling capabilities, a total of 600 low-grade family quarters are earmarked for demolition, with 800 new houses to be constructed in their place. The additional 200 properties will accommodate the projected increase in Service personnel working at the base. Under current plans the houses will be completed by around 2014. Air Commodore Elaine West, the MOD Director of Housing, said: "This is good news for Carterton and good news for Service families at Brize Norton. These flats have been a blot on the landscape for everyone living in and around the town, and this start to the demolition work comes not a moment too soon. "Our Service personnel deserve a good standard of accommodation, so I am delighted that we will ultimately be replacing these and other low-grade quarters around the base with new homes fit for military families in the 21st century." Over the next ten years the MOD expects to spend £8.4bn on all living accommodation, including £3.1bn on delivering new-build and upgraded accommodation. Good grief - I lived on Stanmore Crescent in the 70's - I don't remember those flats as being that awful. I came across this website whilst surfing the net - If it's new to you, it's full of interesting content, especially the article by John Cooper (RAF at Christmas Island.) Here's a link to RAF Tropical Paradise - click on the card 2nd left at the bottom - a Floating Hastings! Thanks Dennis - regretably the Hastings didn't float for very long - on approach into Gan during a storm it splashed in the oggin short of the runway. There's an article on our OBA site by one of the passengers; John Cooper's "Splashdown on the Equator" tells of that incident in great detail. Bloody brilliant to hear from you , esp after so many years. I trust you are well and enjoying your retirement. It was such a surprise and really caught me on the back foot, recounting my life after the mob, which has all been positive. I shall revert with more details soon, but I just wanted to ack your most welcome call, thanks so much. To Tony, the forever diligent friend and brilliant webmaster, my sincerest thanks, for without the OBA many past friendships which have been re-established may never have come about. Thanks champ. As our 'illustrious past prime minister' created a Veteran's Day 27th June – I thought I'd make good use of it! After negotiating with one of our town centre shopping malls, I invited the Royal Navy, Fleet Air Arm, Royal Marines, Royal Artillery, Guards, Paras Associations and the Royal British Legion to join us. Each would have a table display – Standards to be paraded and medals to be worn by all attending. The objectives were (1) to draw public attention to Veterans (2) recruit for each Association and (3) to raise money from public donations to each respective charity. In addition, I enlisted the help of a local Re-enactment Group and Military Vehicles Preservation Group to bring along their vehicles several 'jeeps' and an RAF Austin 'Tilley' – but I had to decline the 'bren-gun carrier' and the 'half-track' as they would have damaged the paved area. They dressed as WW2 British 'Paras' as we thought it would be a nice gesture in view of the sad losses their modern counterparts have suffered recently in Afghanistan. Needless to say, it all went off very well and at the insistence to the Mall Management continued over the next day, Saturday 28th . The support from the public was overwhelming. Not only was there great interest in our histories but we raised £803 for the RAFAssociation 'Wings Appeal'. The other Associations were amazed by just how much their charities benefited. 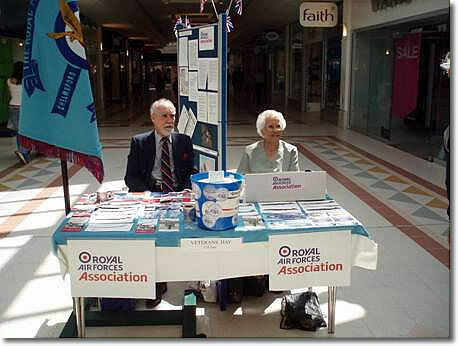 Each had a separate location in the Mall - Here is our table with our display boards extending four sections behind us. 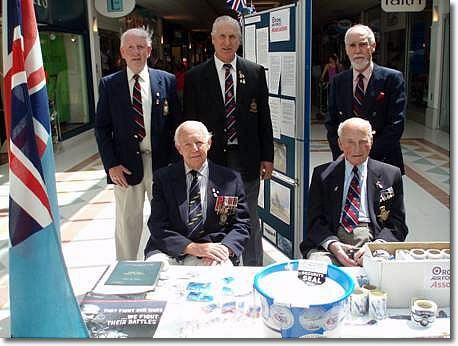 Front row, left, Sqdn Ldr Ralph Tyrrell MBE our President – 85 years – Lancaster Navigator, more than one tour over Germany. On the right Sqdn Ldr Jan Walentowicz - Polish - 88 years. Fought against the German invasion of his homeland in 1939 as he was in the Polish Air Force - escaped to Romania but was captured and interned - escaped and walked to the Black Sea - got a ship to Lebanon, then to Marseilles walked towards Bordeaux but was captured and handed over to the Germans - by now it was 1940. Escaped before being shipped to Germany - made it by foot to Bordeaux and was taken, with others, by ship to Liverpool. 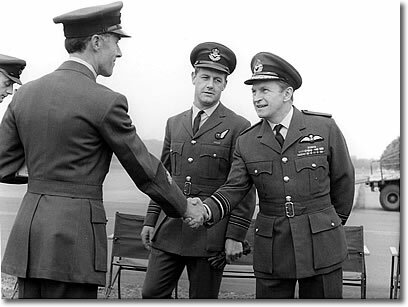 Re-joined his Polish Air Force colleagues and was integrated into the RAF and after numerous trades eventually became pilot - flew Wellington in Coastal Command 1943/45. After hostilities with nothing left of his family and homeland stayed in the RAF and became an expert helicopter pilot, later instructor. Served in the Malay conflict and finally on Air Sea Rescue. What a man!!! He and his wife joined us for lunch last Sunday. Back row, left Jim Machin, our Welfare Officer 75 years - National Service 1955/56 Armourer. Centre, Fred Green, 77 years WOP/AG but just too late for wartime service. Right, yours truly, the baby at 71. On duty early on the first day with my stalwart assistant, 'Jinny' 80 years! Widow of an ex-RAF Officer. Hands up all those who just typed, "The quick brown fox jumps over the lazy dog"
Today was our monthly meeting and as usual a good turnout, probably about 60 in attendance. Our speaker was a chap who has been researching the days of the 40's with prisoners of war, not allies, but German and Italian ones in this country. It really opened our eyes, in fact I was surprised that there were so many camps in Shropshire and it brought back memories of when I was a youngster. I can remember seeing both Italian and Germans who had to work in the area. I can remember when walking to school near Shrewsbury railway station when it was completely covered by a canopy of steel and glass and seeing them up up on the roof painting all the steelwork, starting at the one end and then going back to start again, something like the bridge over the Firth of Forth. He showed us many photos and by coincidence one was of the dad of one of my friends who, when he was a prisoner, was ex-Waffen SS working at the local hospital. He stayed in this country and married a local girl. At the peak in 1946 there were 402,000 German and Italian POW's in camps all over the UK. There were a lot of POW's on British soil back then - hard to imagine. What a great result, Alex. It is so pleasing to discover that people will support such efforts and that Veterans are still appreciated. I know how much time and effort you have put into this venture but I am sure you already know that many people will benefit from your initiative. Perhaps the other organisations involved will also be inspired to redouble their efforts. We're "real proud of you ." Subject: The "New" Air Force! Things are a bit "different" these days eh? More than half of the Armed Forces are extremely unhappy with the state of their equipment, the first comprehensive survey of all three Services has shown. When asked about the standard of equipment and level of resources to do their job 50 per cent were either dissatisfied or very dissatisfied. One in two personnel also said they simply did not have enough equipment to do their jobs properly. With Army housing labelled "appalling" in recent reports, 38 per cent of soldiers said they were unhappy with their accommodation. Huge operational commitments in Iraq and Afghanistan meant less than half of the Army had taken their full 30 days annual leave. The frustrations meant 31 per cent of the Royal Navy, 20 per cent Army and 30 per cent RAF were either dissatisfied or very dissatisfied with Service life according to the survey of 8,850 personnel. More worryingly for military chiefs, more than a third of all respondents said their life was either worse or much worse than compared to what they expected when they first joined up. Morale in the RAF was lowest, with 31 per cent saying it was low or very low followed by the Navy (30 per cent) and Army (27 per cent). Following huge cuts in the number of surface ships and after the Iran hostage fiasco last year, only 7 per cent of the Navy believed that morale was high with 64 per cent saying the Senior Service's moral was low or very low. However more than three-quarters of the Armed Forces still feel proud to be in uniform. But nearly half of the Navy and Army and RAF say they do not "feel valued" and about a third "regularly" consider leaving the military for good but a majority would still recommend joining up. With accounts of soldiers being continually underpaid by the introduction of the much maligned Joint Personnel Administration system it is unsurprising that more than a half of all soldiers are unhappy with the speed pay issues are resolved. Royal Marines have been particularly hard hit over errors in their pay and allowances and this was reflected in 54 per cent being dissatisfied or very dissatisfied with basic pay. A small minority, between 1 and 4 per cent of servicemen and women said they had suffered discrimination as a result of race, gender or sexual orientation. Liam Fox, the shadow defence secretary, said: Gordon Brown's Government just doesn't seem to understand why our service men and women are so unhappy and why they feel so under-valued. "It is shameful that so many of our personnel feel they are not properly resourced and it confirms the growing retention problems that are emerging." The Defence Minister Derek Twigg said: "We know that there is always more that can be done and later this month we are publishing the first cross-government Service Personnel Strategy, which contains a number of measures that will further improve the support we offer to personnel, families and veterans and ensure that we address all of their concerns." Scientists have identified only 4,000 of the estimated 400,000 viruses believed to exist on earth. Have just dug out the old log book, my first UKMAMS trip was from Brize Norton to Wittering and Machrihanish aboard Belfast 362, on 25 March 1975. We took 6 Landrovers and a number of Exercise Pax from Wittering. Not much to say about the trip really, it was wet & windy at Machrihanish and no doubt it was with Alpha Team. However, my most memorable trip, prior to joining UKMAMS was also on a Belfast 369 from RAF Changi up to Tan Son Nuit, Saigon. We took vehicles & rations 70,000lbs in total for the British Embassy. I was on shift at Changi and they decided to send a scratch team up to offload at Saigon, I was up for anything in those days if it involved a flight, so off I went with my camera. It was some busy place in those days, still being at the height of the Vietnam War, Vietcong were around the airport and while we were offloading, some mortars came in! I looked up and asked what the noise was about and one of the guys from the Embassy said, ' Oh just some mortars landing'. When we taxied out later, I took some photos of where the mortars had hit their targets, fighter jets were kept in pens to protect them from blast damage, but several had direct hits and were just sat there all burnt out. It was some experience for a young lad as I was then, the flight took place on 18 February 1968! I heard rumours that although the public back home thought we had nothing to do with the war in Vietnam, the chaps from Hereford were somewhat involved but I never said that. It was a sad time though, I remember U.S. C-130's coming back to Changi at times and body bags being offloaded for onward flights to the states. I also met up with a load of U.S. Naval guys one day in Singapore at some big hotel down Orchard Road, they invited us back onto their aircraft carrier, the USS Ticonderoga that was visiting the Naval Base in Singapore. We turned up the next day, with my camera of course only to be told by the MP's not to use the camera while on the Naval Base, of course I agreed but once onboard the carrier, the US Navy said why not take some photos, I said I could not use the camera, but they said, Hey you are in America now, fire away - so I did. I must find those slides one day and see if I can get them copied or scanned or something, any ideas? 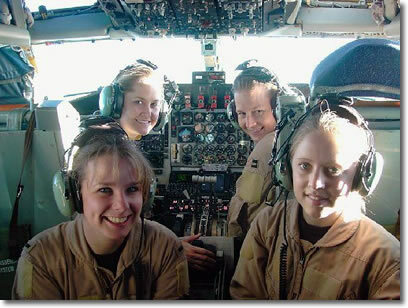 Getting back to UKMAMS, my next real trip was out to Namao, Alberta Canada, via Keflavik on a VC-10 from Brize Norton (XV 105), we handled 9 flights in Namao for Ex. Pond Jump West, then returned on Britannia 637 via Gander and Scampton to Brize Norton again. Thats my time up on the sandbag, keep up the great work. Thanks Peter - I wasn't aware that Belfasts went into Vietnam - that must have been hairy! Here in Canada the big department stores such as Wal-Mart and Zellars have photo departments where you can drop off slides and they will put them on a CD for you relatively cheaply - or you might want to try one of the bigger photography shops in the UK. There are also scanners available that copy slides, depending on how many you have to convert, you may find it cheaper to invest in one. Due to earth's gravity it is impossible for mountains to be higher than 15,000 metres. . . . . .as I was saying before I was so rudely interrupted back in November '03! Welcome back Tony, been searching for you with no luck, then on Wednesday, decided to stick UKMAMS into Google, & up you popped. However on Wednesday, I had other fish to fry as Status Quo were in concert in Vienna. What a night of Rock 'n Roll it was. It's not been an incident free life for me since last in touch. Last August, shortly after reaching the big 6 zero, Austrian Airlines decided to dipense with my services, along with a few thousand others. Massive losses so downsized the fleet by 8 widebodies, & cut a lot of long haul routes. However a few days before I was given the good news, a pal offered me a job here at map, we manage & operate a fleet of exec jets & MD83s, which go out on wet lease. So, finished at Austrian on Friday 31st Aug, & started here on Monday 3rd September - seamless as they say. As you know, my wife Margaret, is a TESOL teacher, back in '04 she met up with an Austrian lady who owns a hotel - very wealthy. She also has a holiday home in Brazil. The village in Brazil is dirt poor, & she asked the locals how she could help. They asked her to set up English Language Teaching for their kids. So Margaret, with me as general assistant were despatched to Brazil to set it all up. This was all of August 2004. We got it all going with the help of the local schools, & paved the way for additional volunteers. We went back again in 2006, by which time we had our own free school were everything was based, but by this time I had also qualified as a TESOL teacher, so was able to do some real work. The place has gone from strength to strength. Our friend Gisi has now opened a hotel in the village, with a hotel acedemy, training youngsters in the hospitality trade, & generally doing good stuff. We were scheduled to go back again this year, but posponed things as our parents are getting on & we feel we should be more local. We are always on the lookout for volunteers who would like to teach English, Computing or German to the kids, & adults. Details from me or check out www.parajuru.com . Volunteers got to find there way there, then food & accn is free, except booze, which is very cheap. Parajuru, a fishing village, is a couple of hundred klicks south of Fortaleza, in the north east. Separately, my step daughter Paula married a Kiwi, & moved down to New Zealand. We've been down twice, once via Sydney in '05, & the last time, '07 via Bangkok. Stopovers on the way back, & cursing for not having hard copies of MAMS old boys contact details in Oz, NZ & Thailand. There surely could have been a few wets, with the memories being dragged back from the mists. For our Kiwi bretheren, Paula lives in Rahetihi in the shadow of Mt Ruapeha, where coincidently the Austrian National Ski Team train in the European Summer, hence Austrian Beer is on sale at all local supermarkets. Not been back to Canada since I last saw you, my sister comes over quite a lot, & we'll be meeting up next month in beautiful Bolton. But then we're off to Edinburgh to see the Tattoo. Saw one of the last Royal Tournaments at Earls Court, so will finally do the double in live action. However who knows the Canadian cheapo carrier Transat are now flying into Vienna, so may get back before too long. Please update my profile to show my new e mail address, with alternate. Address remains the same. Next missive will carry details of an old comrade who I found on the internet, & have since visited, who is eligble to become an member, but was in the RN Regulating Branch as a Master at Arms. Wunderbar to have you back. Well, well, well! I felt certain that you were no longer at room temperature Phil - so happy to see you're still above ground and as active as ever. Looking forward to continuing our friendship and receiving your much appreciated reports from Austria. The Queen has said she is "enormously impressed" by the professionalism of the men and women of the Royal Air Force as she marked its 90th year. She presented new Colours - ceremonial flags - to the service at its largest ceremony for more than 30 years. The presentation was made jointly to the RAF and its ground fighting force, the Royal Air Force Regiment, at RAF Fairford, in Gloucestershire. The Queen then watched a flypast of 90 RAF aircraft, the largest since 1990. The event was to mark the start of the Royal International Air Tattoo at RAF Fairford in Gloucestershire. It was due to be opened to the public on Saturday but organisers had to cancel the air display due to the weather. It is the first time in 37 years organisers have had to cancel a day. A decision on whether to cancel Sunday will be taken on Saturday at 1000 BST. 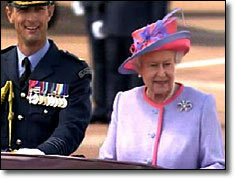 Earlier the Queen told 5,000 guests and 64 squadrons it was the fifth time she had presented the RAF Colours. She told them they should be "immensely proud" of their work but that she knew it came at "great cost" to individuals killed or injured in action, and their families. She urged them to "protect my Colours" and "let them be an emblem of your achievement". Colours are awarded by a sovereign every 15 years to mark a service's achievements. Group Captain Tony Barmby, the event's project officer, said: "For most RAF personnel, involvement in such a parade is a once-in-a-career experience." He added: "I'm very proud to have the chance to play a part." 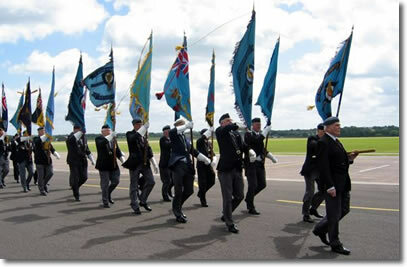 The Queen's Colours were last presented to the Royal Air Force in the UK at RAF Marham, Norfolk, in 1993. Friday's event is the largest staged since the Queen conducted a Silver Jubilee review of the air force at RAF Finningley in South Yorkshire in 1977. The 90th anniversary celebrations began with a royal salute and a flypast by four Typhoons from RAF Coningsby in Lincolnshire. 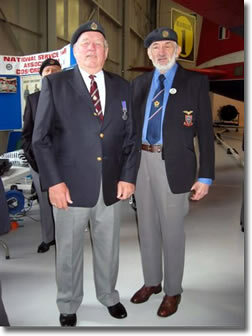 I'm the one with the beard and the 'tubby' one is Pete, my mate ex-Khormaksar, he was a 43 Squadron fitter. He is the brother of the chap that I emigrated to Aussie with back in the mid 60's. We met him on the quay at Steamer Point and later took him and a mate onto the ship to have a look around. Both got arrested on returning to the quayside as they had no identification papers on them, not even their 1250's. I ask you, illegal immigrants into Aden? A smart turnout on a beautiful day! I recognised the Mauripur badge on your blazer right away John - are the cap badges you are wearing regular RAF brass cap badges? The level of compensaton offered to the most seriously injured soldiers is to be doubled, the Ministry of Defence is set to announce. The maximum payout for a severely wounded British soldier, currently set at £285,000, is expected to be increased to £570,000, in addition to a guaranteed income for life. Campaigners have long argued that payments made to soldiers such as Paratrooper Ben Parkinson, who received £152,150 after being seriously injured in a landmine explosion in Afghanistan last year, are unacceptably low. Under the new plan being announced by ministers, there will also be a smaller rise in the awards made to servicemen who have sustained less serious injuries. As part of the MoD's reformed welfare package, troops will also get free university and college places, be fast tracked to the top of NHS waiting lists and given "special treatment" on a wide range of issues to "end the disadvantages" suffered by troops in Britain, defence sources have disclosed. Some of the benefits are also expected to be transferrable to the spouses of veterans killed in action. "This is an initiative across all Government departments to recognise the sacrifices made by British troops and that in some cases special treatment is justified," a Whitehall source said. The Command Paper has been launched at a time when thousands of troops are quitting the Services fed up with poor pay, accommodation and a general feeling of ill-treatment. The Army is currently short of 5,000 out of the 85,000 soldiers it needs for full manning. It will also address the "military covenant" - the duty of care between the Government and the Armed Forces -which senior commanders have said has been broken. In a copy of the American military system, members of the Armed Forces who have served for more than six years will now have their tuition fees waived for university degrees. The health reforms will now mean that those serving abroad will no longer go to the bottom of the NHS waiting list when they return. Disabled veterans will also jump the queue for specially adapted homes and priority will also be given for NHS dentistry. It is also hoped that the thousands of troops who suffer injuries both on operations and in training will return quickly to front line duty with better NHS medical care. Earlier this year The Telegraph revealed that almost 7,000 infantrymen were unfit to fight, leaving front-line troops. One in 14 soldiers is sick or injured at a time when every regiment of 600 faces a shortfall of 100 men because of problems with recruitment and the numbers leaving the Army. The proposals mirror those published by the Conservatives last month where it was promised that servicemen and their families would be given priority on NHS waitings lists. They also said that members of the Armed Forces and their families would will no longer lose their place on NHS waiting lists when they have to move. All families would be guaranteed an NHS dentist in their new posting, regardless of whether lists are full, under the paper chaired by the author Frederick Forsyth and Liam Fox, the shadow defence secretary. Other proposals from the Government are expected to include an increase in the current £285,000 cap put on the maximum compensation given to the most seriously injured troops. The eight-month review has been designed to take into account the disruption suffered by service families who have to move house regularly disrupting schooling and leaving them at a disadvantage for waiting lists. A MoD spokesman said: "It is the first time there has been a co-ordinated, cross-government strategy for delivering better access to key public services and welfare support for our armed forces community." I'm always so happy to receive e-mails from past friends and the following is no exception. Bob joined up through the Boy Entrants scheme back in the spring of 1964, six months after my joining up. We became friends and formed a pop band at Hereford, subsequently entertaining fellow erks and teeny boppers every Wednesday and Saturday evening. We lost touch after graduation. I tried to e mail you about 2 years ago but I suspect it got lost in the ether somewhere. Anyhow, great to hear from you and by way of an update, here are some one liner’s. 1 son by first marriage who is living in San Jose CA. He works in Silicon Valley in micro electronic design. (Masters degree from Brunel University) As a parent I am very proud of his achievement. I have not sought work since leaving air force. I play golf twice a week and fly light aircraft out of RAF Wyton instead. 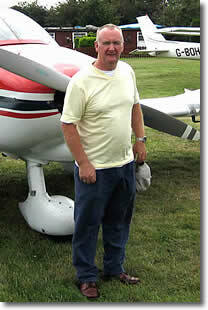 I obtained my PPL about 14 years ago this was a natural transition from Gliding, which I took up in 1982. Do you have any photo’s of the “Blue Diamonds” and can you remember the name of the drummer and bass guitarist? I think the drummer was called Kevin Curtis but cannot remember the bass player’s name. After all 44 years is a long time! I have attached recent photo taken in Sep last year, after flying into Clacton on Sea in a Robin DR400. You will note, less hair and a bit of a pot has developed since we last met. Never mind I will be 61 next birthday so I suppose we shouldn’t complain. That’s all for now Tony, do keep in touch and perhaps you would like to give me a similar update of your life over the last 40 odd years. I regret that I don't have a single photo of our band, The Blue Diamonds. The drummer was Alan Curtis and the bass guitar was played by Dave Carter, both from the 50th Entry, Boy Entrants. I have never been able to track them down. A paleoscatologist studies ancient poop. Met someone you joined up with today, Tony Dunphy who seemed to dissapear from the fold when his wife June died. Didn't know you knew him as I was with him on FEAF MAMS and he was my replacement in Hong Kong. I told him about the OBA and he seemed quite interested. Thanks for the info on having slides put onto a CD, I will try to look into that when I have time. 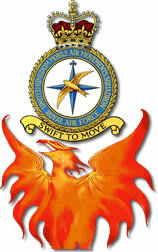 Having just turned 60 I have been waiting to hear from the RAF Pensions people, being entitled to a preserved pension. Anyway I gave them a call today (0800-085-3600) to be told that I have lost out on 2 months pension as they do not normally backdate! It appears that they expect you to claim the pension 3 months before reaching the age of 60, but I have never been told this and it is not written down on anything I have, however it is stated on the form that they are now sending out to me! I was told that it happens all the time, they simply do not contact anyone when they reach the required age and their pensions just go back into the pot until claimed! So anyone who has a preserved pension and is approaching 60, give the above number a call now or lose out. There is one exception to the backdating rule and apparently if you have been in a mental institution the pension can be backdated, I did ask if working for Thames Water counted and the woman said "Yes, definitely!!" Sad news about the Royal Air Tattoo at Fairford last weekend, the whole two day show was cancelled due to weather and the flooded car parking areas. Looks like the information was a bit late getting out as there was still traffic chaos on the local roads early on Saturday, I was hoping to see the Vulcan displaying again having just got the required certificate. I last saw the Vulcan in 1992 during the last display at the old RAF Wroughton airfield, it was a real treat to watch. By the way Tony, did you know that the Belfast did a display once, in Heavylift colours at West Malling in Kent. I was on board at the time, we did the display after a flight back from Canada before landing at Stansted, crazy thing was we could not get one of the main wheels locked down at Stansted and I was down in the hold pumping like crazy on the hydraulics to maintain pressure, what fun. That is it for now, keep up the great work on the OBA. Thanks for the heads up Peter - I made sure I contacted them several months prior to my 60th and was delighted at the expeditious manner in which they handled it - they appeared to go out of their way to ensure that all was okay. Hi everybody, isn't life grand! Just a quickie to let you know that yesterday at 5.10 pm I was given the all-clear by the neurosurgeon. It's been a long time coming and the relief is incredible. It is gonna be fantastic to now be able to once again do all the things I used to do without any reservations, altho I think some will always be there. Most importantly is being able to drive again. Before I go, I feel I must just urge you all to stop and think about yourself and what you have. Consider for a fleeting moment what life would be if something you have and cherish was taken from you. Re-evaluate your dreams and priorities, because my friends I did, and life is not so bad after all, everything considered. Good news indeed DC - I gather the fridge is well stocked?